The weather in the Hudson Valley for today, Memorial Day, promises to be dry and warm. A beautiful day to honor all those who died while serving in the armed forces. Winter damage renovation is finally going to start this week. Barring any unexpected surprises (I am having nightmares) when the kitchen ceiling and walls are opened up, the job should be completed in 3 weeks. Followed by putting my kitchen and house back to normal. Oh I forgot to mention the dreaded cleaning and dusting. During the reno I will most likely be spending my time away from the computer so will not be posting for a while. Had a very small harvest – Swiss chards and lettuces from the window boxes and Italian red rib dandelions from the garden. Did harvested a bunch of garlic green to take to a friend but forgot to take photo. Not a huge amount so I combined all the above with garlic greens from the garden. Made a simple stir-fry with a bit of oil, S&P, delicious! Because the chards transplanted to the garden are still quite small and not yet ready for harvest I decided to cut just the outer leaves of each plant in the window box (instead of pulling up the whole plant as I had originally intended) to assure future harvests. Fertilized with fish emulsion fertilizer after harvesting and should get another meal may be 2 in a few days. Will pull all the plants then and put the window box to rest until fall. The outer leaves of chards in the garden should be ready for harvest in a week or so. Harvested the outer leaves of my window box lettuces, there was enough to make 2 good size salads. 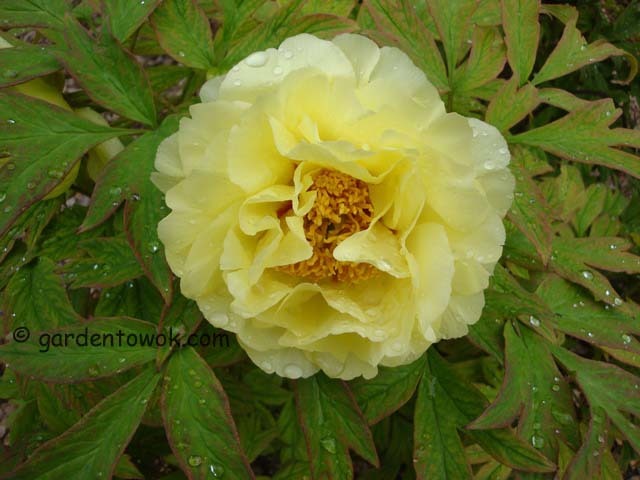 Fertilized after harvesting and will continue to harvest the outer leaves as needed. As with the chards, once the outer leaves of the garden lettuces are ready for harvest, I will pull all the lettuce plants in the window box and put the box to rest until fall. Like dandelions on the lawn, Italian red rib dandelions are very winter hardy and come back year after year. By a happy accident, I planted my Italian red rib dandelions (few years ago) in an area of the garden where it can remain permanently. Now all I have to do is harvest as needed. NOTE: Bought a pomegranate but used only a small portion. Not wanting the remainder to go to waste decided to de-seed the whole fruit and freeze the seeds. Use as needed straight from the freezer. Happy with the results. As you can see from the above photo, the thawed seeds maintained their bright red color and their crunch too. This entry was posted in Gardening, Harvest Monday, Vegetables and tagged avocado, balsamic vinegar, dairy free, gluten free, Italian red rib dandelion, leaf lettuce, meatless, pumpkin seeds, Swiss chard, tree peony, vegan, vegetarian, window box gardening. Bookmark the permalink. I’m so pleased to hear that you’ll have a house to live in with a complete kitchen. Enjoy your time off and eat one of those salads for me. I need to get a window box! You don’t need to get window box, a large flower pot or other container will do very well. Norma, you reminded me of the Swiss chard!!! I just love that plant and the varied colors we get. I’m so anxious to get back to the farm. I think I’ll try to go this week, just for a ride and sitting in the hoop house!!! 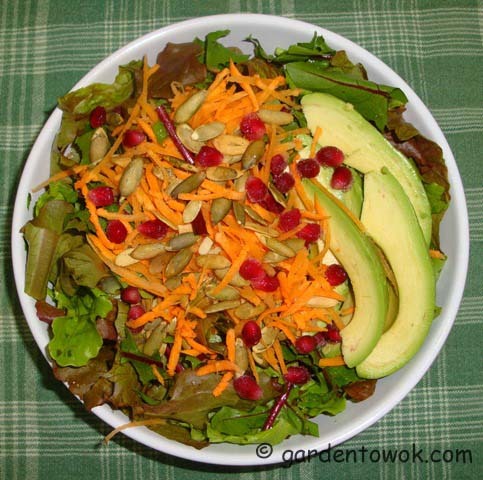 The salad looks great and what a wonderful idea for the pomegranate. I was totally surprised and pleased with the frozen pomegranate results. I hope those renovations go well for you. 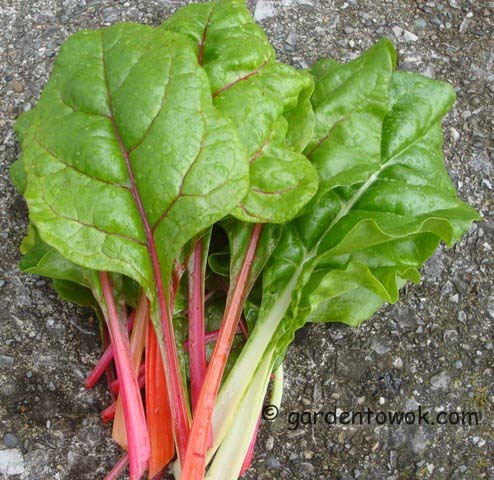 Your chard looks nice. I’m going to have to do a first little harvest of my chard soon. I hope so too, preparing meals in my temporary kitchen is going to be a challenge. 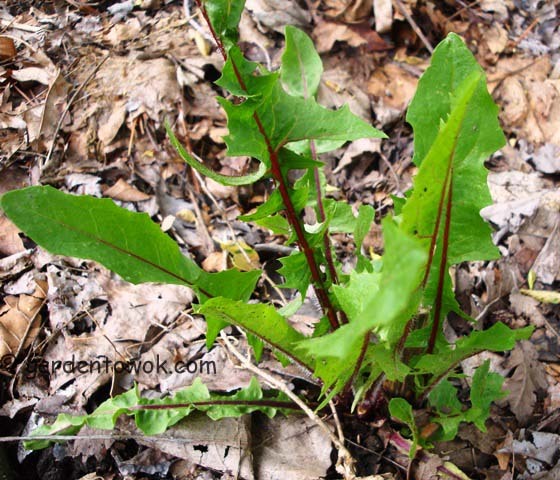 Hadn’t realized red-ribbed dandelion is winter-hardy — is it a perennial, or is it self-seeding? The red-ribbed dandelion is a perennial. Enjoy your time off, Norma. Love your garden lettuce salad. I am going to harvest some too. What kind of lettuces are you growing? in and do the post reno clean up, it might save you from a respiratory infection too. So glad Spring has finally arrive for you! Thanks for the suggestion, I will look into getting someone to do the post reno clean up. Yes, we are finally getting warm weather, things in the garden should be growing at a faster clip now. I am always impressed by how well your window boxes do! Your greens are lovely 🙂 Enjoy your time away! I too am surprised at how well the veggies in the window boxes are doing, I do need to fertilize more frequently but at half strength. Best of luck with the rest of the renovations Norma. I thought of you all day today – I spent the entire day in the garden. What did you plant in your garden? Hope you will be posting about it. A beautiful week to you too. Looking forward to the post and photos. A super day to you too. Thanks, I hope the surprises, if any, are good ones. Definitely will be spending extra time in the garden, still need to take care of the winter damage to the shrubs, etc. Good luck with the renovations, I hope there are no surprises uncovered. Looks so fresh and tasty. I am sure it will taste amazing. Thanks for sharing the wonderful photographs with us. Thanks for stopping by and taking the time to leave a comment. The salad was very fresh and tasty. Everything looks great! Good luck with all your repairs!! Great looking window box greens you got here! Bet they are equally delicious! Yes, they were very delicious. This year my window box greens are doing a whole lot better than my garden transplants. Thanks, I hope everything goes as scheduled. I feel for You, Norma! There is so much that goes into a kitchen renovation! At least you can make a nice salad easily. Good to know pomegranate seeds freeze well. I have to set up a temporary kitchen, meals preparation is going to be a challenge. Wish I had thought about freezing pomegranate seeds earlier, but better late than never. Good luck my friend, I’ll keep my fingers (and toes) crossed that nothing surprising happens in your reno and that it all goes smoothly and your back in the kitchen in no time. I absolutely love that salad the avocado must be delicious in it. I froze my pomegranate seeds too a few years ago and now do it regularly when I see it on sale! If there are surprises I hope they are good ones. Are you having crazy weather also? Yesterday it was 87F, needed a/c, today’s high is 60F and tonight will be low 40’s, need to turn on the heat. Waiting until June 1 to transplant tomatoes into the garden. It’s has been crazy here too Norma, hot and humid one day, chilly and damp the next, but the vegetation seems to be loving it! Good luck, I hope things are moving along well. Good luck with your renovations, Norma, they can sure be trying at times but I’m sure you will love the final results! Your window box harvest looks fantastic! I’m about to try planting sweetpeas in a box because I don’t have the right spot in the garden for them. Fingers are crossed! Thanks, looking forward to the final results. I so wanted to plant sweetpeas in my flower garden but that would be inviting more deer to visit, I am sure yours will do great in the box looking forward to seeing the creative arrangements you make with the flowers.